Winter is the warmest season! The Holidays bring extended families back together again. We invite you to share a teapot full of luxurious Mighty Leaf Tea and let the aromas of cinnamon, nutmeg, and ginger warm your body and thoughts. Check out our Holiday Gift Giving guide for ideas on how to treat your loved ones. 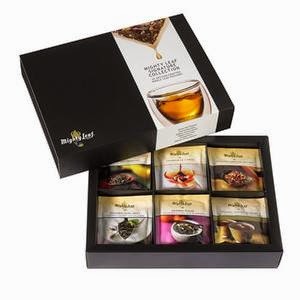 Tea also makes a great thank you gift to bring to Holiday parties. Some of our favorite tea gifts are below. Mighty Leaf Tea was founded by husband-and-wife team Gary Shinner and Jill Portman, who turned into reality their dream of infusing new life into the ancient indulgence of tea. In our carefully chosen blends you will find all natural ingredients including hand-picked whole leaf tea, blossoms, herbs, fruits, and spices. Our vibrant leaves and blossoms are too big for ordinary tea bags, so we designed our own silken, artisan Tea Pouches™. We hand-stitch them with unbleached cotton, without using glue or staples. Seriously, these are the largest tea pouches you have ever seen! Satiate your senses with our wonderfully full and nuanced flavors and intoxicating aromas. I LOVE LOVE LOVE tea. In fact my nickname is grandma among my girlfriends because when we all lived together I was 2 and 3 years old then them and every night had to have my cup of tea. We were only in our early 20s but they found it so funny. One night they hid my beloved tea and there was hell to pay. I need my tea! I don't even have a favorite. I like them all black tea, herbal tea, green tea, I don't play favorites. I am a coffee lover as well. I don't know if it is habit or if I just love the warm, calming feeling I get when I drink one or the other. This week I gave up my beloved coffee because after trying Mighty Leaf Tea I was truly hooked and couldn't get enough. 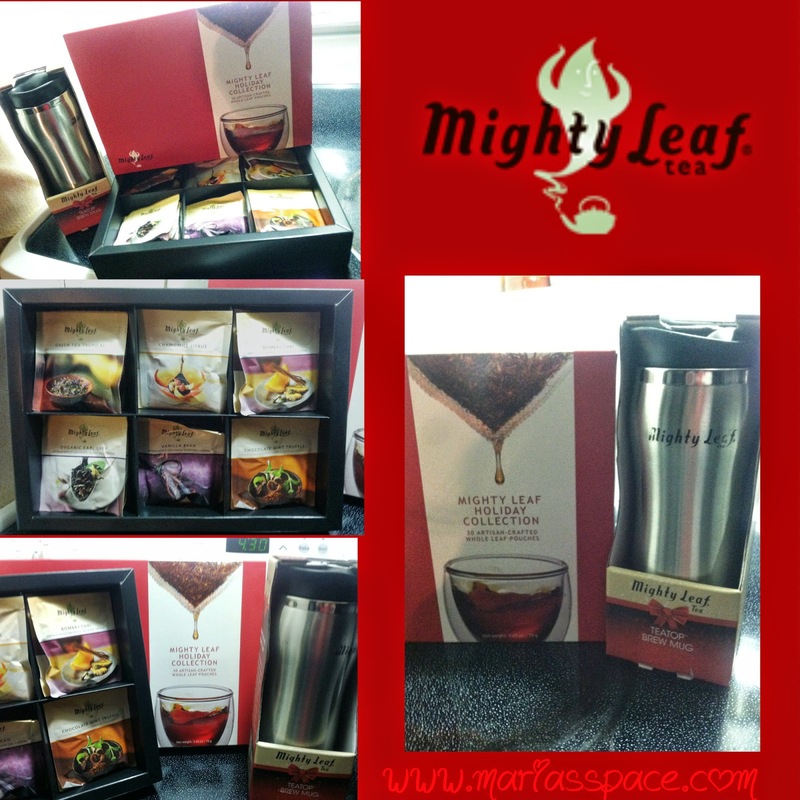 I received the Mighty Leaf Holiday Collection Tea Chest to try along with their patented travel brew mug. The mug has a slit for your tea bag which means you never lose it and your tea doesn't over brew because as you drink it the bag stays close to the lid. The Tea is a whole other story! I drink a lot of tea. This tea is honestly and I am not even doing the blogger thing here. If you are a friend of mine that I see daily, you have heard about this tea. I even gave samples out at work as hard as it was because honestly all I kept thinking was how I would have fewer but I NEEDED to share these. It wasn't enough to just say how good they were. Here is a picture of the tea. It looks wonderful and unprocessed. I have never seen tea like this. I am used to tea that just looks like a bunch of black stuff in a tea bag. OH...and speaking of tea bags...I love these tea bags. They are almost so pretty I don't want to use them. Truly a work of art. Each bag looks hand sewn as if someone who loves you made them for you. 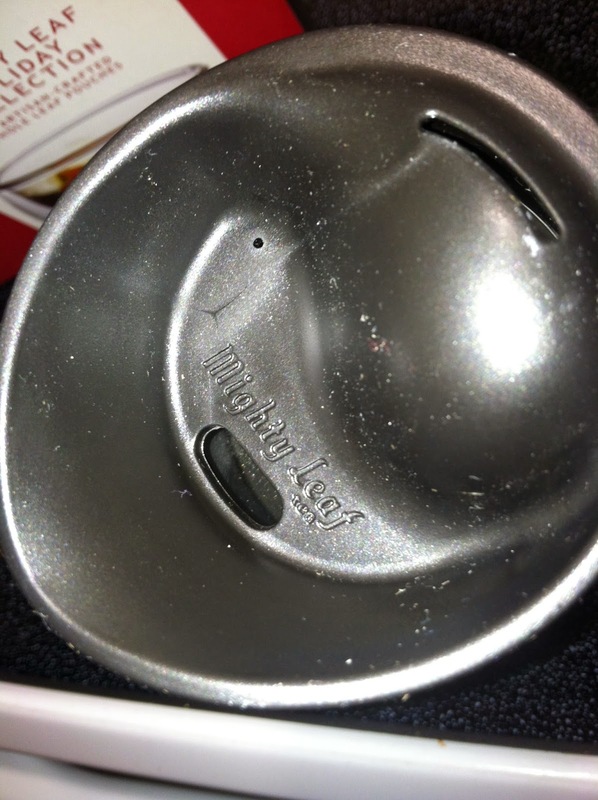 Here is a picture of the cup lid. Do you see the little slit in the up right corner? That's the spot for your tea bag. 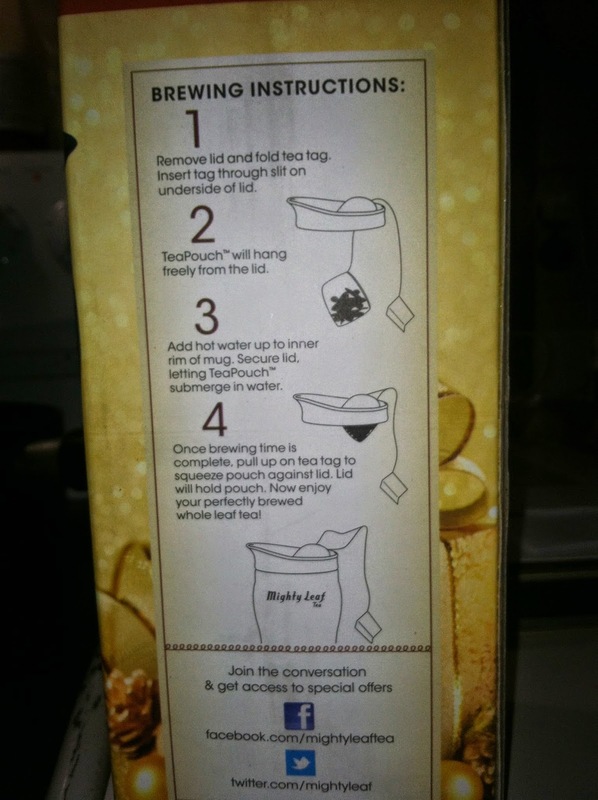 The second pic is the brewing instructions. Pretty cool right? Steep one Vanilla Bean Tea Pouch in 6 oz. of boiling water for 5-6 minutes. While tea steeps, froth 6 oz heated milk or soy. Add agave nectar/sugar to taste. Stir and enjoy! 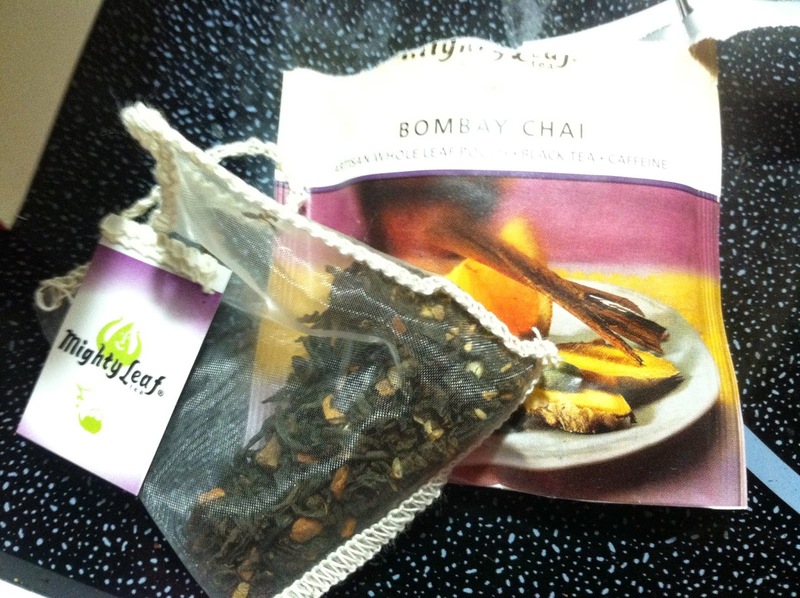 Substitute Mighty Leaf Tea Organic African Nectar or Bombay Chai for a twist on this recipe. Steep tea pouch in 12 oz hot water for 4 minutes. Pour tea into medium sized pot. Add the apple juice, cloves, nutmeg, cinnamon, and cinnamon sticks. Muddle the orange into the pot then drop in the orange peels too. Simmer on stovetop for 15 minutes for richer flavor. Serve. I highly suggest the Gift Box I received as a holiday gift (you can see it in my Holiday Gift Guide. 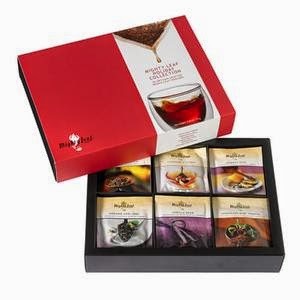 Share the warmth of the season with Mighty Leaf's Holiday Collection Tea Chest. Packaged in a festive red box, this collection contains 30 of our artisan-crafted whole leaf pouches in signature tea flavors perfect for the holiday. Let me tell you, the Chocolate Mint Truffle is by far my favorite tea ever. I love the smell and the taste. It truly smells like Chocolate mint. You can even see the mint leaves in the tea bag. I would like to try Mighty Leaf's version of my favorite tea, Earl Grey. Their site says it was chosen Best Earl Grey by a major magazine. I'd love to try the holiday blend loose tea. I would love to try the flowering teas like Thousand Days Red Jasmine. They look so unusual! I want to try ALL their flavors, but the Chocolate Mint Truffle sounds amazing. I want to try Chamomile Citrus. I would love to have the Earl Grey and Chamomile Citrus! I would like to try the Earl Grey decaf tea. The Earl Gray decaf tea looks good! I'd love to try the Coco Chai Rooibos tea. Tea and ginger are two of my favorite things, so ginger twist would be lovely for me. I would also love their Chamomile Citrus flavored tea. 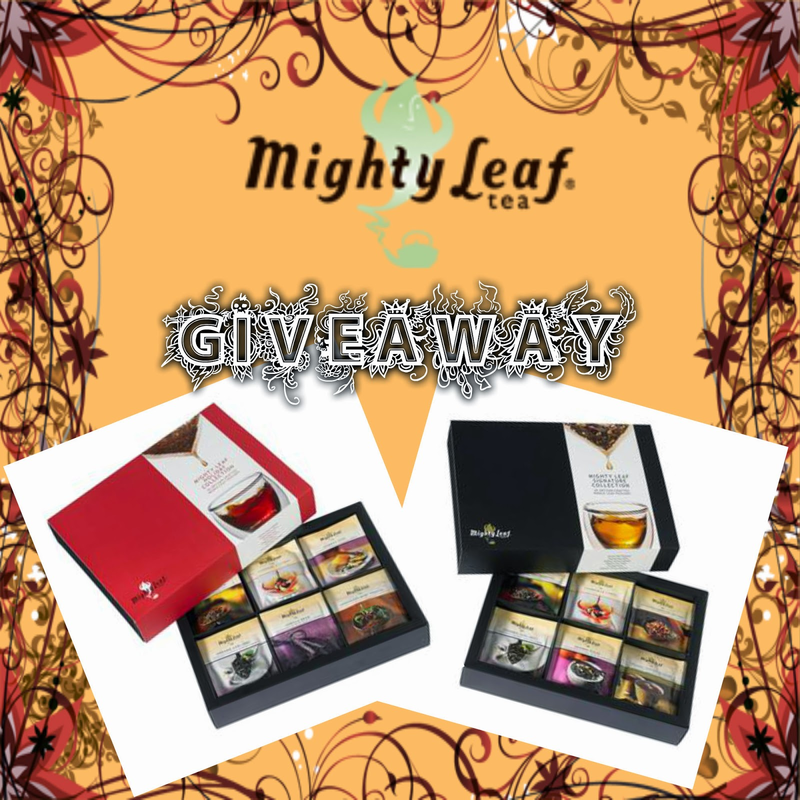 I liked Mighty Leaf Tea on Facebook. Liked, Commented and Shared on Facebook. I would love to try the vanilla bean black tea. I would love to try the Orange Dulce Black Tea. Thanks so much for hosting this giveaway! White Orchard is the one I would love to try sounds so good. I'd love to give the Coco Chai Rooibos Tea a try! I love the Man Crate from your Gift Giving Guide! I'd love to try the Organic Rooibos tea! I'd like to try their Chocolate Mint Truffle Tea. I would love to try the marrakesh mint. I love mint teas and it just sounds yummy. I'd like to try their Black Currant Iced Tea.